Do you like to get up early and take on the day? I knew you did. I went to Panera for breakfast this morning and saw they had a new sandwich. The Breakfast Power Sandwich is a gussied up version of a McMuffin for around $4, but if you are eating at Panera, you already knew that. 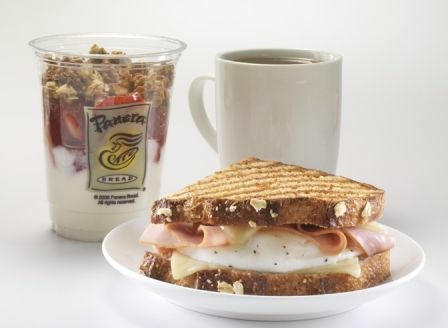 This sandwich sports black pepper ham, freshly cooked egg and Vermont white cheddar on whole grain bread. The sandwich boosts 23g of protein, but also comes with 360 calories and 14 g of fat. It’s a good breakfast, but due to its high price point, McD’s gets my business. This entry was posted in Food & Drink and tagged breakfast, panera. Bookmark the permalink.